At Salem Covenant Church, our desire is to provide a caring community for our members, friends, and neighbors. You may call the church when you are aware of needs in our community. We are not often called by hospitals when people are admitted. Please let the Church Office know when a family member or friend has been admitted to a local hospital. Caring Friends – A group of trained people who are available for a one on one caring relationship with anyone in need. Foot Care Clinic – A trained professional available monthly for foot care. Red Cross Blood Drive – Check back for our fall date. Learn more HERE. How can I request visits by a Caring Friend volunteer? Call Salem Covenant Church yourself. Complete and mail the request form included in this brochure. Ask a family member to contact Salem Covenant Church. Ask a family member to complete and mail the request form included in this brochure. Visit with individuals over the phone, through email, or in their homes. 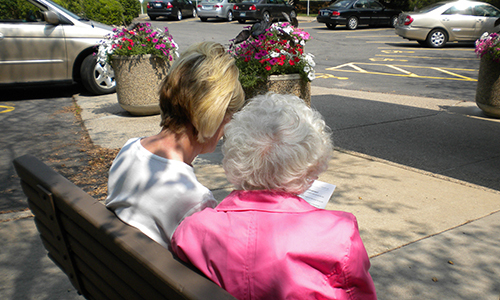 Provide socialization and reduce isolation and loneliness. Visit length and frequency are variable. Caring Friends are volunteers who commit to using their gifts and talents to serve homebound, sick, and troubled persons and assure them of God’s love and the church’s concern for them. Caring Friends Ministry volunteers do what a friend would do for a friend. They reach out to the person who needs occasional help or long term support. Their volunteer activity is structured and coordinated through the efforts of the Caring Friends Ministry coordinators and Salem’s Faith Community Nurse. If you have a health concern or would like spiritual support during your illness or hospitalization, please call the Church Office and request that a member of the Pastoral Staff or the Faith Community Nurse follow up with you. Due to changes in the Federal laws, health institutions are prohibited from notifying faith communities without your written consent. It is often easier if you or your family notify us. This allows the pastors and/or Faith Community Nurse to come alongside you to offer prayer and support during a difficult time or rejoice with you and give thanks to God. Also, please know that your privacy will be respected. Your pastors or Faith Community Nurse can visit and no one else needs to know. 6-week class for caregivers of a parent, spouse, neighbor, friend. You will learn how to: manage stress and difficult emotions, communicate more effectively, create balance in life, locate helpful resources, and find caregiving strength through your own unique spiritual practices. Cost: Sliding Fee Scale; Register by contacting 651-280-CARE (2273) or caregiving@wilder.org. Stepping On is a 7-week, 2 hours each week, well-researched falls prevention program, published in the Journal of the American Geriatrics Society. Offered to people 50 years and older who have fallen in the past, at risk of falling or have fear of falling. For more information or to register for one of the workshops, please call Mercy Trauma Services (763-236-7016). Helping adults manage chronic conditions to improve quality of life. If you live with a chronic condition, you know that your illness can make life, and your health, hard to manage. Our chronic disease, self-management wellness classes are designed for adults age 60 and older in the Twin Cities who want to improve their quality of life, become more confident in managing their health and reduce healthcare costs. Family and friend caregivers are welcome to participate. Wilder leads these wellness classes for older adults and also trains other organizations to host them. For more information, contact Melissa Gibbs at 651-280-2515 or melissa.gibbs@wilder.org. Our mission is to provide a comfortable and engaging environment where people with memory loss and their care partners can laugh, learn and remain socially connected with others traveling the same journey. Who: Individuals with early to moderate Alzheimer’s & their care partners. Spend a Saturday obtaining information, hope and practical strategies for dealing with the complexities of mental illness. Participants learn about mental illnesses, treatments, coping strategies, the mental health system and local resources. Held Saturdays from 9:00 to 3:00 unless noted. Please bring your own lunch. For information call NAMI Minnesota, 651-645-2948. This class is for family members who have a loved one living with a mental illness. Learn about mental illnesses, identify resources, build communication skills, reduce stress and find support. Join others for this 12-week series taught by experienced family members. You must call the contact person listed in your area to become registered for this course. Check HERE for any upcoming classes. NAMI Minnesota (National Alliance on Mental Illness) is a non-profit organization dedicated to improving the lives of children and adults with mental illnesses and their families. NAMI Minnesota offers education, support, and advocacy. This Grief Support Group is a 12-week class. This class is open to anyone that has experienced the death of a loved one. Each topic is self-contained so you do not have to attend in sequence and includes a brief video seminar, followed by supportive group discussion. Click HERE to find other local groups. HealthEast Hospice is offering a grief education class designed to help adults better understand and cope with their own grief after the death of a loved one. This is a class, not a support group. Educational materials will be provided. There is no cost for the class, but registration is requested due to space limitations. This class is for adults who want to: understand some basic characteristics of grief, learn about common grief reactions, realize that what they are experiencing is normal, and cope better with the stress of grieving. Call 651-232-3543 or email griefsupportservices@healtheast.org to learn more. When you are on the journey of grief, it is often helpful to seek the support of others. This group is intended for people grieving the death of their spouse or significant other. Group members will receive relevant grief education materials and support. This is a time for you to talk about what is on your mind with others who are grieving the loss of a parent. Grief can be difficult, but exploring it with others who understand can help. Grief education and ideas about how to cope with the loss of a parent will be discussed. The death of a loved one can be painful, bewildering, confusing and lonely. Working through one’s grief is a difficult, occasionally traumatic task. Sharing with others who are experiencing similar losses can be helpful and turn grieving into an opportunity for personal growth. The Growth Through Grieving group is open to anyone grieving a loss through death. The group follows an informal style. Meets Monday afternoon from 4 to 5:30 pm. at the Maplewood Professional Building, in the Watson Education Center on the second floor. There is no cost for this group. Registration is not required for this group. For additional information, contact Chaplain Ted Hein at 651-232-7397 or by e-mail. In this writing series, you will safely explore your feelings of grief through writing. It is an opportunity to give voice to your inner wisdom and write about what matters most to you – what you remember, what you miss, what you cherish. You will be guided through specific writing prompts to find renewed ways of viewing your grief journey and giving shape to your life. Call HealthEast Grief Support Services (651-326-1541) for more information and to find out when they will next meet. There is no cost, but space is limited. The Twin Cities’ North Metro Grief Support Coalition sponsors the six-week Growing Through Loss series twice yearly, providing an opportunity for individuals to obtain information and support for a variety of loss and grief issues. No pre-registration needed. Registration is taken at each session. You are welcome to attend one or all of the sessions. Visit our Web site at www.growingthroughloss.org. A new Celebrate Recovery group is starting Thursdays at 6:30 p.m. at Christ the King Lutheran Church (1900 7th St. NW, New Brighton). Celebrate Recovery is a Christian-based 12 step program. The purpose of the group is to encourage fellowship and to celebrate God’s healing power in the road to recovery from addiction. For more information contact Gordon Druvenga or 651-633-7515 x 3216. Excelsior (click), Saturday, September 29, 9:00 a.m.-3:00 p.m.
St. Paul (click), Saturday, September 29, 9:00 a.m.-3:00 p.m.
Richfield (click), Saturday, October 13, 9:00 a.m.–3:00 p.m.
Find a list of other classes, here. Sharing the love of God with joy!